We published the first in a new series of blogs this week which focus on health economics and making the case for prevention. The blogs come from our chief economist Brian Ferguson - look out for the second instalment tomorrow. We published a blog this week, one week on from welcoming the independent report from the Mental Health Taskforce, discussing the opportunities for prevention and improving outcomes. It also touches on PHE's work on mental health so far. The campaign to raise awareness of the symptoms of bladder and kidney cancers continues. In the video above Dr Dawn Harper explains the varied appearance that blood in pee can take and encourages those who notice this symptom, even if it’s 'just the once', to visit their doctor straight away. We are now accepting abstracts for this year's conference, which will be held in Manchester on 13-14 June. Both quantitative and qualitative abstracts may be submitted and the deadline is midnight (UK time) on Thursday 17 March. Two new guides have launched which offer free resources aimed at the housing sector and improving end of life care. They contribute to the ambitions set out in the national housing and health memorandum of understanding and particularly explore the potential for joint working between local housing, care and support organisations and public health teams. Our new neurology data catalogue went live this week. The catalogue lists resources relevant to neurology intelligence and includes national datasets published at clinical commissioning group (CCG), local authority or provider level. It also allows access to information on data availability and location. 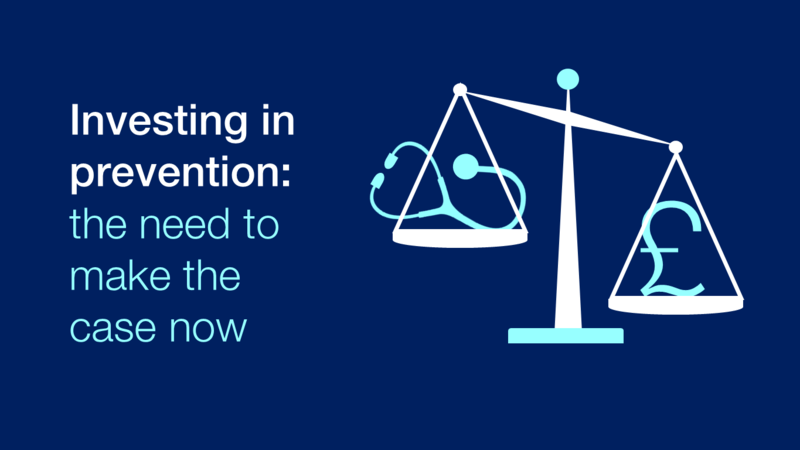 Investing in prevention: is it cost-effective?